MyGreenSoapbox: THEY ARE POISONING OUR FOOD! THEY ARE POISONING OUR FOOD! Recently there was a show on television that revealed that some Australian supermarket giants are importing huge amounts of cheap fruit and vegetables from overseas and that several of them, including frozen vegetables contain “a cocktail of dangerous chemicals”. Some of the pesticides and fungicides are totally banned in Australia, yet these goods not only contain them, but have them in high levels. It was also very concerning that a green grocer was selling so-called organic beans, lemons and broccoli and all were contaminated with toxic chemicals. It truly has come to the point where we can trust nobody but ourselves to produce our food. If you laced someone’s food with arsenic it would be considered a criminal offence and you would be charged with attempted murder or similar and penalised accordingly. So, why are these manufacturers and the supermarkets that are aiding and abetting the poisoning of our population allowed to get away with it? At the front line of production, conventional farmers are subject to an increased risk of prostate cancer. Additionally, those farmers who use pesticides on their farms face the risk of their own children and the children who live nearby, suffering more birth defects, brain or other cancers and hyperactivity disorders than the general population. Exposure can also lead to, abdominal pain, stomach cramps, anxiety, unsteadiness, confusion, depression, diarrhoea, laboured breathing, dizziness, sweating, lost of bladder or bowel control, eyelid, face and neck twitching, loss of memory, kidney pain, nausea, vomiting, unusual weakness and slow heartbeat. Even more serious consequences of long-term occupational or environmental exposures include Parkinson’s Disease and cancer. If we look at dietary exposure to foods which contain pesticide residues, we find that they have been linked to stomach upsets, head-aches, breast milk contamination, allergies, unexplained ailments, reduction in sperm quality and the list goes on. Residues from potentially carcinogenic pesticides are left behind on some of our favourite fruits and vegetables. In 1998, the FDA found pesticide residues in over 35% of the food tested. Many U.S. products have tested as being more toxic than those from other countries. The concerning part is that current standards for pesticides in food do not yet include specific protection for foetuses, infants or young children despite major changes to federal pesticide laws requiring such reforms. This is a global issue. No rigorous safety appraisal has or can be made of the endless number of mixtures of pesticides that humans are exposed to. Don’t be fooled into believing the assertions made by regulators that pesticide residues are no threat to human health. As the guardian of your own and your family’s health, the only way you will only truly know what is in your food is to produce it yourself wherever possible. Labelling laws allow too much lee-way and fudging of the facts and pure greed and politics are resulting in a blind eye being turned to a lot of what is going on. Don’t think you can just wash the toxic chemicals off and everything will be okay BECAUSE IT WON’T BE OKAY. The chemicals infiltrate the actual tissue of the fruit or vegetable. These chemicals do not just flush out of your body either – THEY ACCUMULATE and can result in terrible and deadly health issues later on. We are all in effect ticking time bombs. It does not matter whether you live in a house or a flat, you can grow good organic food. You don’t need huge garden plots to grow your own safe nutritious food. 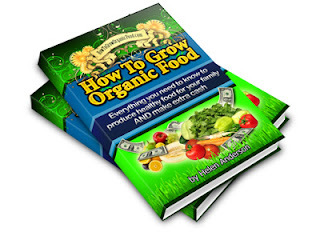 A book I highly recommend you reading is How To Grow Organic Food by Helen Anderson It explains all about the risks we are facing today from chemicals and pesticides and then provides very easy to understand information on how we can address that through growing our own food. I got myself a copy and find it invaluable. Please stay informed so that you will be in charge and you will know that your family is eating right.